In early December, Missouri Gov. Mike Parson stopped by Hunter Engineering near Lambert airport to raise money for his campaign committee. Or, to be precise, for two campaign committees: One is the traditional campaign operation, called Parson for Missouri, while the second is a political-action committee – called Uniting Missouri – that officially is separate. Missouri Gov. 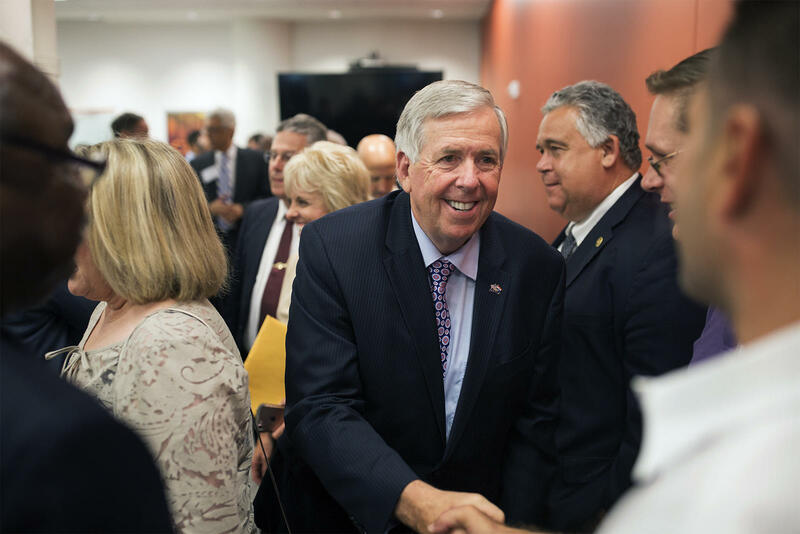 Mike Parson during a stop in St. Louis this summer to meet with area officials, business people and community leaders. Parson for Missouri can collect donations of no more than $2,600 apiece. Uniting Missouri can collect contributions of any size. Veteran Republican consultant John Hancock oversees the Uniting Missouri PAC. He says politicians, the press and the public should get used to seeing the two-pronged approach to raising campaign money. “These PACS are necessary in Missouri’s political environment today because of the campaign-finance laws that have passed,” Hancock said, referring to restrictions approved overwhelmingly by voters in 2016. Parson can openly raise money for both committees, at the same time, even though the PAC cannot coordinate its spending with the governor’s campaign arm. After December’s event, for example, wealthy financier Rex Sinquefield cut two checks totaling $1 million to Uniting Missouri. It won’t be known until campaign-finance filings at the end of this month whether Sinquefield also wrote a much smaller check to Parson for Missouri. Other PAC donors or supporters include such prominent Republican players as businessman Sam Fox and Hunter Engineering executive Stephen Brauer. So far, Uniting Missouri expects to report raising more than $2 million since it began raising money last summer, just weeks after Parson was sworn in following the resignation of then-Gov. Eric Greitens. That's likely more than the Parson for Missouri committee. Parson has no control over how the PAC spends its money, although it’s probably a sure thing that the cash will be used to promote his candidacy should he run for a full term as governor in 2020. Although Hancock points to the 2016 passage of campaign-donation limits, the two-pronged approach for major campaigns began earlier and exploded this fall. Greitens, for example, mastered the use of outside groups and large donations in his 2016 bid for governor. As governor, he and his allies set up nonprofits – known as 501(c)(4)s – that could raise donations of unlimited size from donors who did not have to be identified. In Missouri’s recent U.S. Senate race, a record amount of outside money was spent to help or attack Democrat Claire McCaskill and Republican Josh Hawley. Much of that money came from donors who have remained secret. Some Missouri Democrats, including St. Louis County Executive Steve Stenger, also have employed the two-committee approach — but on a much smaller scale than Parson. Hancock says that Parson should be praised for his commitment to making all his political money public. Hancock said he and Parson share a disdain for “dark money,’’ where the donors are not disclosed. “It may be legal, but it’s not right,” he said. But Parson and his allies are equally committed to raising as much as possible, and in large amounts.